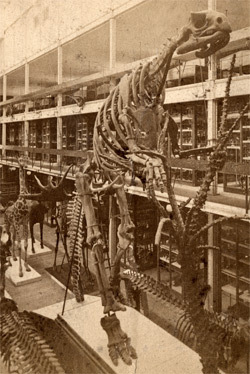 Celebrating the 140th anniversary of the dinosaur display. Look at enough dinosaur displays and you begin to ask questions beyond the scope of the exhibit. What would a sleeping dinosaur look like? How do you clean one of these things? Where’s the cafeteria? It’s not that the dinosaurs themselves are uninteresting — the danger they suggest infuses museum halls with a sense of potential energy. Instead, it’s the fact that once you’ve seen one T. Rex, all other T. Rexes start to look alike.